Looking for some suggestions guys... In the middle of purchasing some Rota RB's for my 4 door. 15x7 +12 offset. I know it's harder to fit them in the back because the 4DR isn't as easy as the coupe. Keep in mind the rear quarters have already been rolled. What do you guys think about the offset? too aggressive? running 280zx struts up front. also have slotted rear x member. Some help would be appreciated. Dave Patten sells VTO wheels and he recommends a +18 in 15x7. I ran a 15x6+12 ZXT wheel on my old wagon and everything fit with 195/50s. okayfine wrote: Dave Patten sells VTO wheels and he recommends a +18 in 15x7. 18" 600 lb. spring cut in half then shortened to 8" for rear springs in stock location, approx. 300 lb. 4 1/2" at front crossmember, 5 1/2" at rear diff. Currently aligned by me at 1/8" toe in front, 1/2" rear toe in rear, 1/2 degree neg. camber front and rear. Waiting for the autox season to start. 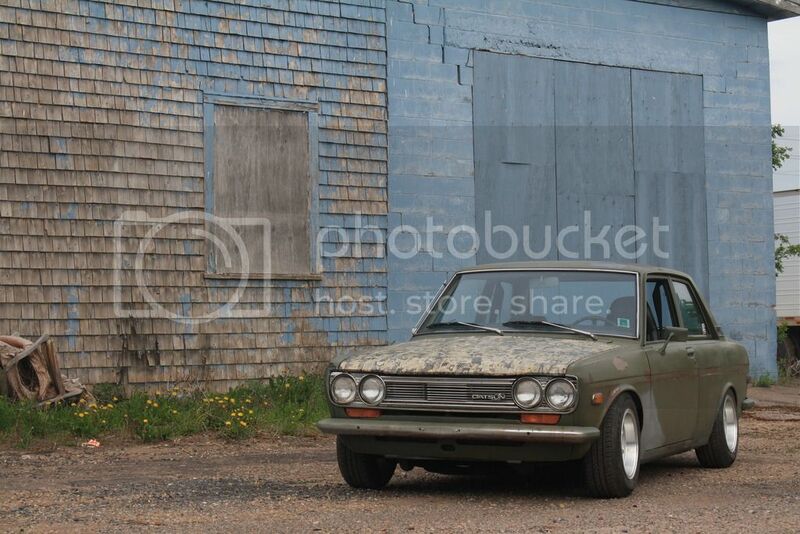 I've been driving 70's Datsun sedans, wagons, and roadsters almost every day since 1983! 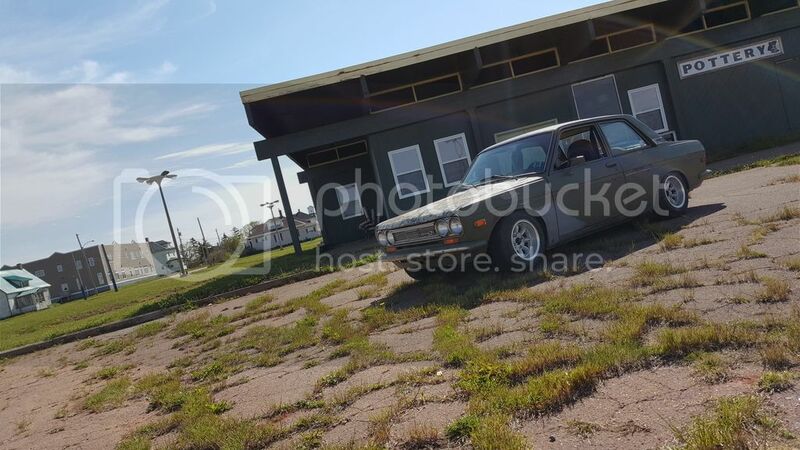 68 Wagon - I wish every one would have a list like you just made on the first page of their build threads. The only thing you left out was to ad a picture because I would love to see your cars stance. Thanks again for sharing 68 Wagon! Here's a pic of the VG with the Boffenkamp air damb removed. I repainted it but am considering an Orange Line bre style from Futofab so I can run air cooled brakes like Bertvorgon's. here is a pic with the Boffenkamp installed....decided that brake ducts like Keith has are not needed as track days here are unavailable. Out Back - 80s F-Body shocks, D50 springs with 2 coils cut. I'll get rocker measurements when i get home from work. General suggestion is to start with equal rates front-to-rear and tune from there. You've got way soft rear rate compared to front. 510 ride actually improves when you stiffen the rear, you don't get so much of the pogo action. bertvorgon wrote: This is the ducting, cheap to build and EFFECTIVE! Fancy knocking up another set? Just saw this message...sorry but no, actually takes quite a bit of time to build these, and do not have the time now, too many of my own silly projects going on. I made a total rebuilt, and i need ref shocks absorber rear axel for use um rally raid in Marroc. Someone have experience in this setup ? This thread has some interesting information. It was fun re reading all of it.